New Winter 2018: BFFs share a special bond that often lasts for life, so celebrate your best friend or your daughter and her pal with a female friends ornament personalized to be truly unique. The besties forever, both brunette girls ornament personalized from the Russell Rhodes collection arrives in our classic velvet gift pouch. Share the girls’ details with us, and will paint them on by hand in a font more stylish than shown to produce a personalized friends ornament they can share – or we’ll customize one of these affordable personalized ornaments for each. 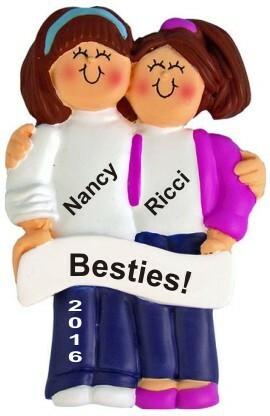 Make them smile this holiday season with the best friends two brunette girls personalized ornament!